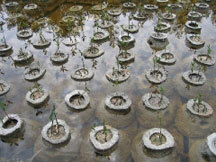 This technique uses pre-cast substrate to provide the oyster larva with a firm base to adhere and propagate. 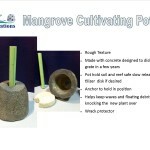 This type of restoration technique provides a stable substrate for oyster larva settlement and the potential to perform as an effective wave energy dissipater and erosion control device. 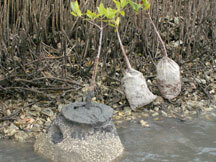 We then planted a red mangrove encased in a tightly woven mesh bag into each reef ball.